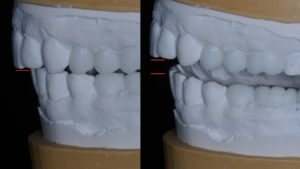 Often when we complete complex restorative cases, one of the components is to change the vertical dimension of occlusion. A super common question that gets asked is how much should we alter the vertical? In truth, the answer to that question is easy. It will be determined by placing the upper anterior teeth in the face for maximum esthetics. We can level the maxillary occlusal plane to this position and then open only as much is needed for restorative convenience. This is often the occlusal thickness of the materials to minimize tooth preparation. A more important question to ask when altering vertical is: How will the anterior occlusal relationship change? When we change vertical, we are changing the position of the mandible in the arc of rotation. Because the mandible moves on this arc, altering vertical changes both the vertical and the horizontal relationship of the anterior teeth. As we open vertical, the mandible arcs down and back, thereby increasing the overjet or horizontal space between the upper and lower incisors. If we want the anterior teeth to stay coupled, we will then have to change the labial position of the lower incisors or lingual of the maxillary incisors. This change is often limited by normal anatomic tooth form, reflective zones and lip support, and can be positive as it shallows the anterior guidance. It can also help reduce force on the anterior teeth. This same increase of vertical dimension decreases the overbite or vertical overlap of the upper and lower incisors. Again, this is shallowing the anterior guidance and can be very positive for patients at higher functional risk. In cases where we are lengthening the upper incisors for esthetics and opening vertical, the two changes work together to maintain the inter-incisal angle or reduce it. Steepening the guidance is something we only do with great care. Analyzing overbite and overjet on a set of diagnostic models is one of the key treatment planning decisions for restorative cases. How do you manage complex restorative cases? Let us know your thoughts in the comments!